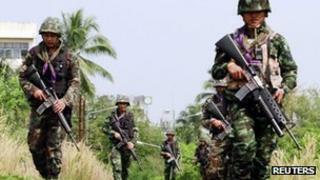 Thailand is holding peace talks with Muslim insurgents aimed at curbing violence in the south. Government officials are meeting representatives of the Barisan Revolusi Nasional (BRN) rebel group in the Malaysian capital, Kuala Lumpur. The talks follow a deal reached in February with the group, which is one of several operating in the area. More than 5,000 people have been killed since a separatist insurgency reignited in the Muslim-majority region in 2004. The Muslim militants, who are fighting for greater autonomy from Buddhist-majority Thailand, carry out almost daily gun and bomb attacks against civilians and security forces across three southern provinces of Yala, Pattani and Narathiwat. Hours before the talks, police said suspected militants killed three soldiers in a road-side bomb attack in Narathiwat. "Today's main focus is to reduce violence. Today we will focus on building mutual trust and good relations," Thai National Security Council head Paradorn Pattanatabut said in Kuala Lumpur. "I am confident that they will communicate our message to their militants but because BRN is a large organisation we have to give them some time." On Wednesday he told AFP news agency that negotiators would seek a halt to attacks on civilians as proof that rebel leaders had influence on the ground. But it is not clear how much influence the BRN has or the extent to which it speaks for other groups involved in the insurgency. The insurgents are being represented by Hassan Taib, a veteran campaigner for autonomy, whose authority over the armed militants who carry out the attacks is questionable, reports the BBC's South East Asia correspondent Jonathan Head. He has asked Thailand to withdraw troops from the south, to give an amnesty for insurgents and to declare the area a special administrative zone. The Thai side, which does not yet include representatives from the army, has said it will not discuss any of these demands yet, our correspondent adds. Instead, in these first talks the two sides will be sizing each other up, to assess whether either is really able to deliver the concessions needed to end the conflict. Can Thai peace talks with rebels succeed?